Keelung Port | PROSPERCO | Prosperco Logistics Int'l Corp.
Keelung was opened as a commercial port in 1863 and a naval defense headquarters was set up here in 1872. In the Ching Dynasty, China’s last reigning house, Liu Ming-chuan, Governor of Taiwan, initiated progress for harbor development and constructed a railroad linking Keelung with Taipei. Under his administration, the first wharf in Keelung Port was completed in 1886. It has already been more than one hundred years since the port began to operate. During the Japanese occupation (1895-1945), a five-stage plan was initiated for the subsequent port development, but the final stage of the plan was not completed because of the outbreak of World War II in 1939. During the war, the harbor area was heavily bombed and almost all of the port facilities were entirely destroyed. 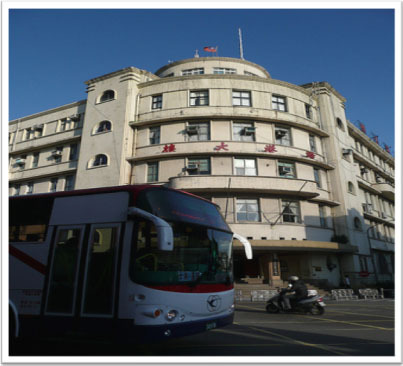 Keelung Harbor Bureau was originally founded on Nov. 9, 1945. The bureau immediately exerted every effort to remove all ship wreckages and carried out necessary dredging and other worker to restore the functions of the port. Since then, Keelung Port has made great progress and ranks now as one of the major ports of the world. Keelung Port is located at Lat.25°9’26.5″N. and Long.121°44′ 22.5″E. on the northeast tip of the island province of Taiwan, the Republic of China. It faces to the sea in the north and is surrounded by mountains on three other sides. It really is a seaport full of scenic beauty. The Port has shipping routes linking globally with all the other major container ports.